I heard from this farm a couple years back and planned to go there since, but as lazy as I am, I haven't been there yet. Has anyone been there? Please give us your comments. The Caldermeade Farm situated on the South Gippsland Highway just south of Pakenham and Kooweerup and is a great place to stop off with the kids. The farm is very unique because it enables visitors to watch a milking and learn about how a dairy farm works. Here you can pat some baby animals, look at the calves, watch the cows being milked and perhaps enjoy a milkshake or something to eat in the popular and cosy cafe. Open Hours Daily 9am – 5pm weekends and 9am – 4pm weekdays. 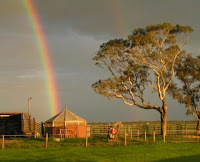 Location 4385 South Gippsland Highway, Caldermeade 3984. When to get the best deal? Tired of looking for coupon codes?